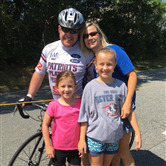 Riding in the PMC and raising money for the Jimmy Fund and the Dana-Farber Cancer Institute is a personal crusade for me. As many of you know my father was a patient of the Dana-Farber until he succumbed to leukemia in November of 1988. It is a terrific event and one I am very proud to be a part of.